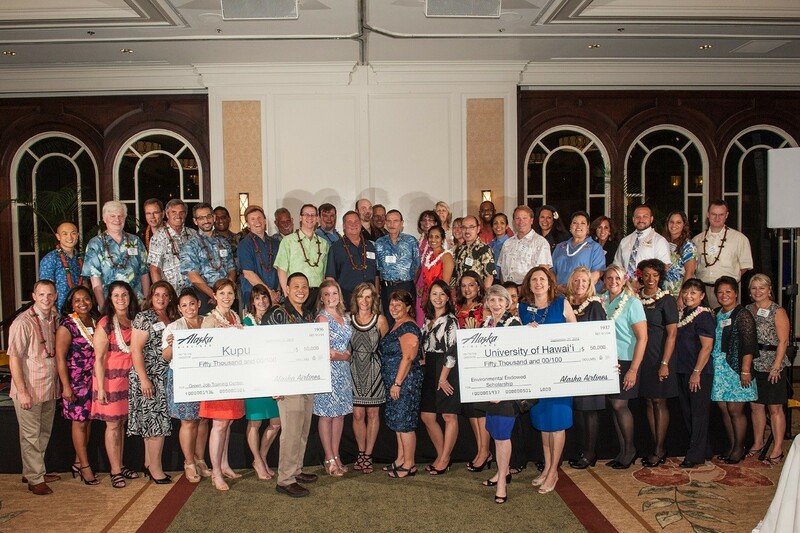 Last night, Alaska Airlines announced gifts totaling $100,000 to two local organizations in Hawai‘i, in support of youth, education and environmental stewardship. The announcements were made during an event at the Moana Surfrider in Waikiki, which honored Alaska’s community partners throughout the state. From day one, when Alaska first started service to Hawai‘i in October 2007, our relationship with the Islands has always been more than just business. Our company was born in a region where air service is integral to the way of life, much like here in the Islands. We understand the importance of reliable, dependable air service for kama‘aina (local Hawai’i residents) and feel a great affinity for Hawai‘i because of our similar cultures. Our commitment to caring for our communities, our customers, our environment and each other is a fundamental part of who we are and what we do. In tight-knit communities like Alaska and Hawai‘i, this is ever more important. Over the past five years, Alaska has donated $1.5 million in cash and in-kind services to more than 130 Hawai‘i non-profits, including Aloha United Way, Make-A-Wish Hawai‘i, the Nature Conservancy of Hawai‘i and many others. Last year, the Alaska Airlines Foundation awarded its first grants to public charities in Hawai‘i – $30,000 across three non-profits to benefit Hawai‘i’s youth and educational programs and services. Today, we’re upping those contributions with $50,000 each to Kupu and the University of Hawai‘i. Focused on developing the next generation of leaders in industries like conservation, renewable energy, agriculture and sustainability, Kupu has a vision for Hawai‘i’s future and provides training in green jobs for teens and young adults. This gift will enable and empower youth to transform the world and help create Kupu’s Green Job Training Center on the island of O‘ahu. Building on Kupu’s work to empower young adults and provide them with the capacity not only to make a difference today, but also to unlock their potential for tomorrow, we have created the “Alaska Airlines Environmental Endowed Scholarship” at the University of Hawai‘i. As the public system of higher education in Hawai‘i serving nearly 60,000 students, UH has a rich history of research, teaching and curriculum development, service and stakeholder activism on environmental issues. This scholarship will provide support to local students at any campus in the University of Hawai‘i System with an interest or focus in environmental sustainability. “We are most grateful to Alaska Airlines for this generous gift that establishes an endowed scholarship to support students at all 10 University of Hawai‘i campuses,” said Donna Vuchinich, president and CEO of the University of Hawai‘i Foundation. We have the privilege of flying our customers to one of the most beautiful and amazing places on earth, and we are dedicated to doing our part to keep it that way for many generations to come. We’re proud to partner with these important organizations, in helping to build a brighter future for Hawai‘i.